This year’s Welcome to the Future Festival will take place on 22 July 2017. 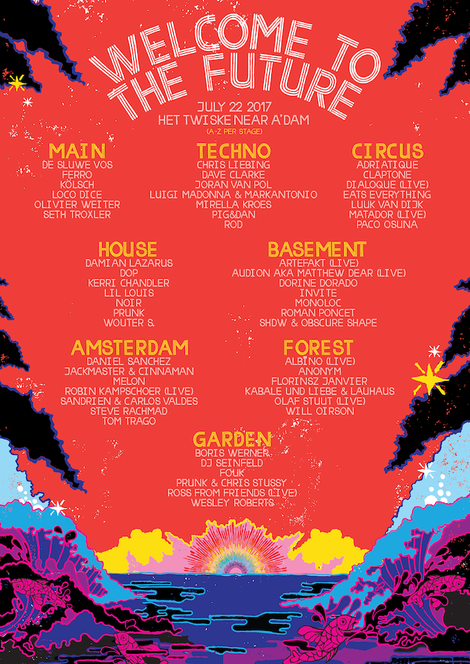 For the 11th year in a row, Het Twiske’s nature reserve, just outside of Amsterdam, will host possibly one of the Dutch summer’s most extraordinary house and techno events. Headliners include Loco Dice, Chris Liebing, Seth Troxler, Dave Clarke and Damian Lazarus. Welcome to the Future includes some of house and techno’s most relevant DJs and live-acts. Household names like Loco Dice, Chris Liebing, Seth Troxler, Dave Clarke, Kölsch, Damian Lazarus, Kerri Chandler and Lil Louis are among those headlining the eight stages. And, as always, the Dutch scene is strongly represented, with names like Tom Trago, Steve Rachmad, ROD, De Sluwe Vos, Joran van Pol and Wouter S.
Both on the house and the techno side, there are new sounds to be discovered. The addition of the eighth stage, Basement, allows further exploration into the deepest realms of techno, with artists like Artefakt, Monoloc and Audion aka. Matthew Dear (live). And two of lo-fi house’s most remarkable names are set to bring the heat at the Garden: Dj Seinfeld and Ross From Friends (live). With its leave no trace philosophy, organic food and free water bars, Welcome to the Future is in the top ten greenest festivals in the world.